Charles Foran has won the Writers’ Trust prize for nonfiction, for his biography of Mordecai Richler, Mordecai: The Life & Times (available at Laidlaw Library). 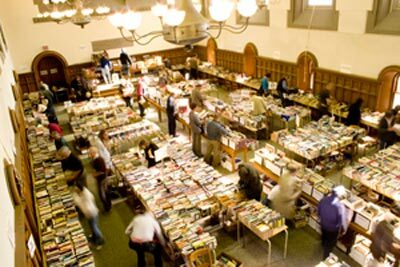 The amazing annual UC book sale is underway! It’s in East & West Halls, University College, from Fri. Oct. 14 until Tues. Oct. 18 (hours etc.). The sale is run by volunteers (alumni and friends of UC), and the money you spend at the Book Sale largely goes to support Laidlaw Library. Such sad news that Richard Landon, the amazing Director of the Thomas Fisher Rare Book Library, passed away yesterday. To quote Larry Alford (Chief Librarian of UofT), “his work to build in Fisher one of the world’s greatest rare book libraries is a legacy that will endure for generations to come.” I also have fond memories of taking his course on rare book librarianship, many years ago.